WAKEFIELD TRINITY will dust themselves off and go again when they play host to Widnes Vikings this evening. 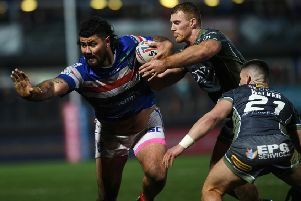 Trinity’s 100 per cent record in Betfred Super League ended when they were beaten 30-18 at Wigan six days ago, but captain Danny Kirmond says confidence has not been dented. Kirmond admitted: “We were disappointed because we don’t think we played our best. Sometimes that happens and you can jag a win from somewhere, but Wigan are a good team and full credit to them, they played well in the second half. “We can learn from it, especially our discipline. We invited them into our half too much and when you are playing against a really good team like Wigan it is going to be difficult to continually defend your line, like we did in the second half. “We have got to fix our discipline up, but I think that happens sometimes in games, especially when you are away. Trinity went into round five in third place on the table and Kirmond insisted they are “really happy with the start we’ve made”, but he said more improvement is needed. “We said we wanted to win four out of our first five and we’ve achieved that, but you can’t rest on your laurels in Super League,” he stated. “We say every year it is a really even competition and I think this year is probably more so than ever. In the first five weeks there’s been some real shocks and a lot of really close games as well. The moment you take your eye off the ball and settle for where you are, that’s when you find yourself on the end of a thumping. Widnes have won only two of their opening six games, but one of those wins was at home to Leeds Rhinos and Kirmond knows they will be a threat if Trinity aren’t switched on from the first whistle. He said: “They are kind of in a similar situation to where we’ve been in the past. They have got a very good squad and a lot of talented players, but for some reason a lot of people have written them off this year. “They have already proved this season they are a very good team when they play well and it’ll be a really dangerous one. If we turn up with a poor attitude they will turn us over, there’s no doubt about that. Mason Caton-Brown, Ryan Hampshire and Pauli Pauli are also in contention for a recall to Trinity’s side tonight, with Keegan Hirst dropping out from the 17 beaten at Wigan. Wakefield Trinity: from Arona, Ashurst, Caton-Brown, England, Fifita, Finn, Grix, Hampshire, Horo, Huby, Johnstone, Jones-Bishop, Kirmond, Lyne, Miller, Pauli, Randell, Wood, Tupou. Widnes Vikings: from Burke, Chamberlain, T Chapelhow, Craven, Dean, Hanbury, Heremaia, Houston, Ince, Inu, Johnstone, Leuluai, Marsh, Mellor, Olbison, Runciman, Walker, Whitley, Wilde.